I don't know about all of you, but I would venture to say that most people like to live in a clean, clutter-free space. Am I right? Or am I right? And moving will force you to de-clutter, and I will say that I am so glad! Our place is more organized than ever. Most of that has to do with the fact that I had two weeks off after we moved, before I started my new job, so I actually had the TIME to put some good storage and organization systems in place. Also, it helps that we moved from an apartment to a house with a two car garage, so we increased our space, without really increasing the amount of stuff that we have, so that's a win-win. So, I jumped at the chance to review this book. At first, I was intrigued. A clutter-free house in 5 days? Sounds pretty good. Then, when I started reading, I realized that the level of clutter-busting this book is talking about is a different level than I generally need. I am like an anti-hoarder. And I stay pretty organized. The 5 day strategy is really for anyone who has a LOT of stuff, and doesn't have a place for everything. I don't mean to make myself sound super clean and organized, I'm certainly not perfect, and I still like to have some notice when guests are coming over, but we generally don't have non-clear surfaces. BUT, if you do have a mess and too much stuff on your hands, this book will definitely help you get a grip, and bust through that clutter. The basic ideas are to get a team together, get some boxes, and go through your home level-by-level, and pack the clutter up. Then, box-by-box, unpack the items and make sure they go to their own place. Remember, I said there's nothing like moving to force you to organize? This strategy is kind of like moving, but not moving. I did learn some great tips and tricks for staying on top of things, though. I love the ideas of timing yourself to see how much you can get done, like the idea of the "ten minute tidy." I would definitely recommend this book if you are in over your head in clutter. If your house already looks like a copy of Real Simple Magazine, or you generally have good systems in place, you can still learn from the tips and tricks to keep your house that way. The other cool thing about this book even for those of us who are pretty organized already, is it can help us understand how to tackle a MAJOR de-cluttering job. This is great, because I'd love to help friends who want to do some organizing, and it's good to read about a strategy for tackling a big project, that works. 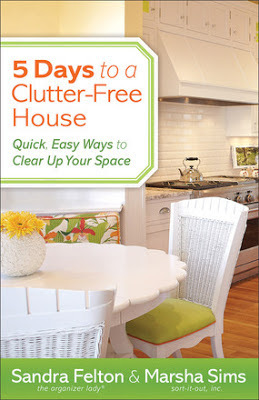 You can check out 5 Days to a Clutter-Free House for more information. Full disclosure: I was given a copy of this book in order to review it.